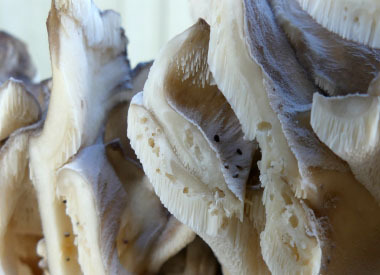 Overview: Maitake has several common names which includes Hen of the Woods, Ram's Head and Sheep's Head. 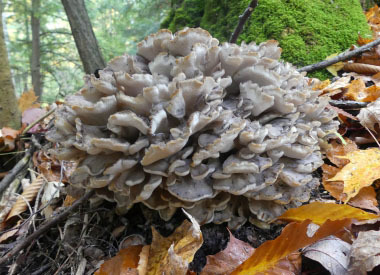 Hen of the Woods is perhaps the most frequently used common name in Canada and the U.S. Many of these specimens will often weigh as much as 9 kilos (20lbs) and sometimes they can grow to about 23 kilos (50lbs). Due to its dull colour, from a distance it may be difficult to spot with autumn leaves on the ground. It is known as “Laubporling” in Germany, the “signorina” mushroom in Italy, and both as maitake and kumotake (cloud mushroom) in Japan. 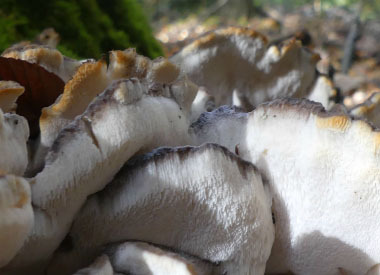 Distinguishing Features: The fruit body is composed of clusters of flattened caps that to some, are reminiscent of a sitting hen. The fruit body can be 10 to 100 cm (4 to 36”) across or more. From the bottom, the stem and branch structure has an appearance somewhat to the underside of a cauliflower. Each individual cap can be anywhere from 2 to 8 cm across (3/4 to 3”) with grayish to brownish tones often with a whitish zone in the middle of the cap. Caps are about 1/8-1/4 inch thick. Sometimes thinner. The pore surface is grayish in younger specimens becoming more white with age and developing some yellow or brown tones as it passes it's peak. 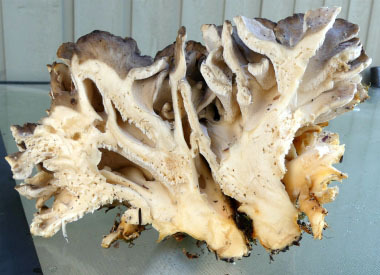 Height: Hen of the woods is not a fungi that is really measured in height. Although, many specimens can grow quite high (about 30cm or 1'). It does have a single central white stem with a complex branched structure like broccoli. 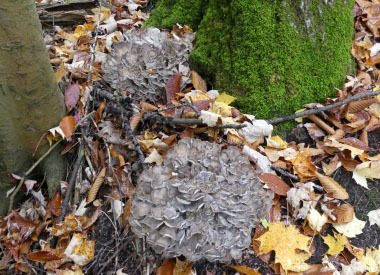 Habitat: This tasty fungi is abundant in parts of Eastern Canada and the U.S. where there are many large oak trees. Typically, it is found on dead or dying trees or stumps, usually around the base. They may grow all at once or sometimes come out over a period of two or three weeks. It grows in northern temperate forests. It is not unheard of to see it growing in the northwestern or southeastern states. Hen of the woods is found in China, northeastern Japan, and throughout Europe. Spore print: White spore print. 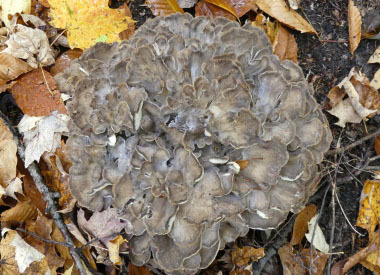 Season: Hen of the Woods is an autumn mushroom and can grow well into November depending on location and conditions. Edibility: This is considered a choice edible. In addition to being a great edible there is growing evidence that it is highly medicinal, boosting the immune system to fight cancer and stabilizing blood sugar as well as blood pressure. It is great sautéed, roasted, deep-fried, and dried. It has a really pleasant, crunchy, very chewable texture. A moderately thick batter is best for deep frying maitake. You can dehydrate these in slices and eat them like chips. They can be ground into a powder once dried; add to all your favourite meals and in smoothies.